Israel - The animal rights organization Let Animals Live has called upon the IDF to provide improved nutrition options to its vegetarian and vegan servicemen and women. The letter, drafted by the group’s attorney Yossi Wolfson, follows up on the mass complaint made in October by vegan soldiers about their eating arrangements and the IDF’s pledge shortly thereafter that the army was working toward improving these issues. Despite that announcement, Let Animals Live has determined that such advancements had not yet been completed. For years, the army has failed to provide vegan soldiers with food that matches their needs, even though the basic supplies to do so are already available in military kitchens such as dry cereals, tahini, fruits and vegetables, the organization said. Instead, the IDF has provided vegan soldiers with an additional subsistence allowance in their salaries. Not only is the allowance insufficient, but the soldiers have neither the option to store the food they buy nor the means to cook the ingredients, according to Let Animals Live. In the letter to the IDF, Wolfson suggested that military kitchens be equipped with more vegetable options, so all soldiers can receive wholesome, fresh and cooked meals prepared under supervised and hygienic conditions. This way, the letter argued, the burdensome process of determining who is entitled to subsistence allowances would be eliminated and vegan soldiers would not be sent out to improvise their own meals. Following the October complaints, the IDF issued an update on its website on October 24 about the army’s policies on veganism. Some changes already made in the past few months have included permitting vegan soldiers to bring their own food into the military dining halls, rather than eating separately, according to the IDF announcement. In addition, synthetic berets and shoes have become available without an advanced statement on the matter, the information said. The berets, however, are currently available only in green and black. Meanwhile, recognition that a soldier is vegan requires only a phone interview, rather than the filing and notarization of many documents as was required previously. Emphasizing that “the major effects of Israeli society will need to further changes in the future,” the announcement said the next step under examination is the military vegan diet. Regarding the synthetic berets, in particular, Wolfson argued in the Let Animals Live letter that the head coverings should be available in every color so that “veganism does not come at the expense of soldierly pride. In addition, it is important to make sure vegetarians are also able to easily forgo leather boots, without receiving the answer that such an option is only available for vegans,” Wolfson wrote. In response to the organization’s letter, the IDF spokesman’s office told The Jerusalem Post on Thursday night that the IDF’s public inquiries chief had received the letter and would be in contact with the writer as soon as possible. “The IDF is doing its best to provide vegans a service environment that matches their way of life by providing vegan berets, vegan shoes, subsistence allowances, etc.,” the IDF spokesman’s office said in a statement. The IDF is working with the Israeli food industry to identify what types of foods might be appropriate substitutes for vegans, the response explained. “The intention is to bring a vegetarian dish to the dining halls by serving an alternative that does not contain animal ingredients and provides a solution for vegans as well,” the statement said. 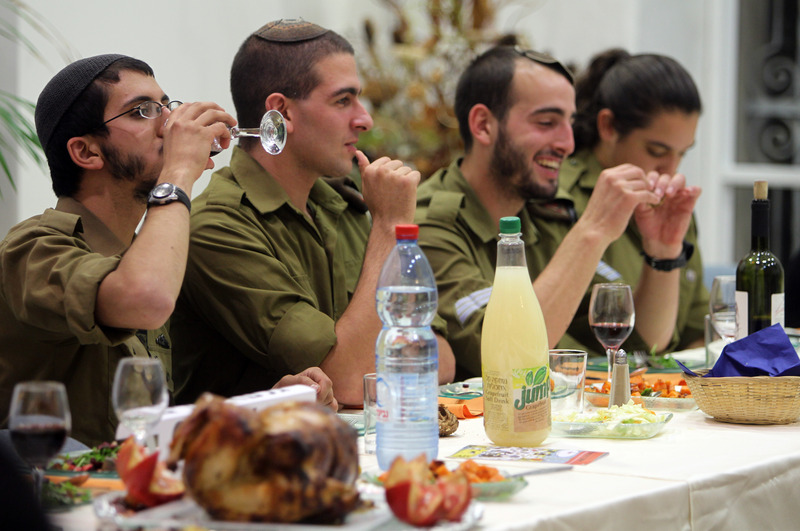 The brave chayalim of the IDF should be honored for their service as well as being makayem the mitzvah of tikun olam by becoming vegetarians. Raising beef and fowl is one of the biggest sources of greenhouse gases when the amounts of fuel, fertilizer etc used in raising and transporting meat are added together, without even considering the emissions from flatulence from cattle. Also, a vegan diet is so much healthier for the young men and women of the IDF. The government should make it easier for them, not more difficult. Cuz like we really dont have any other problems. Oh brother! Isn't fertilizer used to grow plants too? Doesn't getting vegetables to the market require using fuel? Maybe we should eliminate them too? Stop making your own parallels for Torah Concepts of tikun olam ...after the flood man was permitted to eat animals..so to insinuate that it is not on the up and up for one to eat animals is contrary to our Torah teachings....Stop promoting a left wing agenda as Torah rules of tikun olam..
"makayem the mitzvah of tikun olam"
Nowhere in the Torah is it mentioned "tikun olam". So, if you consider "tikun olam" a real mitzvah, you may be actually transgressing the aveirah (sin) of "al tosef" (do not add or subtract from the mitzvos in the Torah). What #1 posted is so over-the-top silly, I think he was being facetious.